Sea ice in the Arctic Ocean is in a downward spiral, with summer minimum extents about 40 percent smaller than in the 1980s. But predicting how the sea ice is going to behave in a particular year is tricky: There are still many unknowns about the conditions of the sea ice cover, to say nothing of the difficulties of forecasting weather and ocean behavior over seasonal timescales. A grassroots initiative launched in 2008 compares the efforts of different research teams each year to predict end-of-summer Arctic sea ice. This year, three NASA teams are among over three dozen groups that submitted at least one prediction. The participating groups in the Sea Ice Prediction Network (SIPN) use different methods, ranging from statistical analysis to dynamic models, gut feelings and combinations of techniques. Teams can submit forecasts in June, July and August based on the current sea ice conditions at those times. Each fall, the project releases an analysis of the year's submissions, reviewing lessons learned and providing guidance to future research efforts. 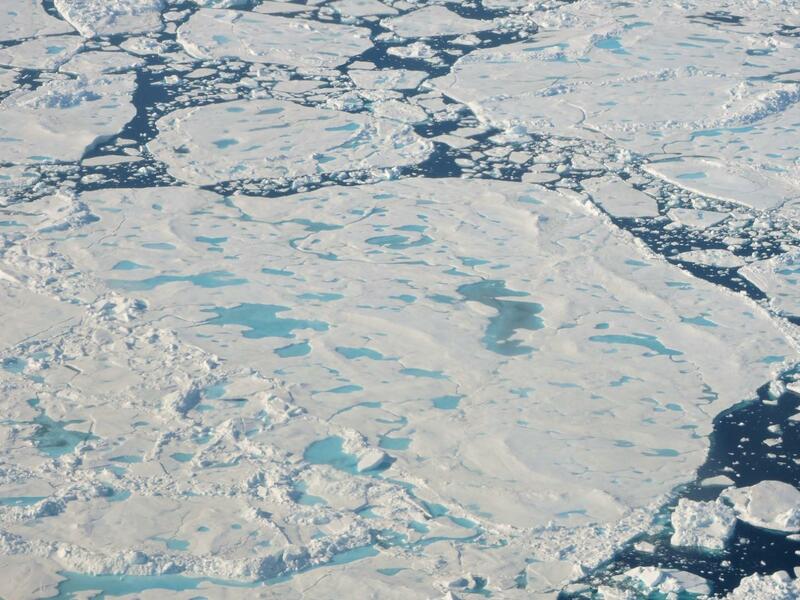 Among other data, the participating teams use sea ice concentration — how much of a given area is covered in ice — and extent, which takes into consideration all areas of the Arctic Ocean and surrounding seas where ice covers at least 15 percent of the ocean surface. Higher sea ice extents and, more importantly, higher concentrations make the ice more resistant to melt, because less of the ocean is exposed and thus less able to absorb solar warmth. The concentration and extent datasets are based on methods developed back in the 1970s and 1980s by scientists at NASA's Goddard Space Flight Center in Greenbelt, Maryland, and currently curated by the NASA data archive at the National Snow and Ice Data Center (NSIDC) in Boulder, Colorado. "One of the difficulties with the melt pond model is that we don't have many good observations of melt ponds in the Arctic for validation," Petty said. "That's what Operation IceBridge is now trying to provide with their recent summer sea ice campaigns." "It seems that the ice that remains in the late summer is a function of how thick the ice was to begin with," Cullather said. "We ran our forecast in June without the sea ice thickness and it came with a much higher prediction than when we actually introduced the thickness measurements. That suggests that adding in the thickness observations is changing our values." NASA IceBridge data, along with measurements from ESA's (European Space Agency) CryoSat-2 satellite, provide key thickness information. With NASA's Ice, Cloud, and land Elevation Satellite-2 (ICESat-2), a mission scheduled to launch in 2018 that will measure the height of the sea ice above the ocean surface, improved thickness information will become available to inform melt predictions. "I only use data from the past 12 years because before 2006, the edge of the sea ice pack at the beginning of the melt season was located much farther South, so it would melt more quickly in July and August than it does now," said Meier, who has participated in SIPN since its beginnings and is a member of the leadership team. Despite the sea ice pack starting the melt season from a record low maximum yearly extent in March, none of the predictions from Petty, Cullather and Meier call for this year's September extent to be less than that of 2012, which is the lowest ever observed during the satellite record of Arctic sea ice measurements that began in 1979. Still, their forecasts are suggesting an extent in line with the Arctic sea ice's long-term downward trend. "Summer storms can have different effects," Cullather said. "If the ice is reasonably thick, the storm can distribute the ice pack so it then covers a larger extent. If the ice is very thin and you spread it, it'll allow it to melt faster because there's more open water being warmed by the sun." "There's more and more interest in seasonal predictions of the Arctic sea ice, but at the same time things are challenging because of the changing conditions of the ice pack and how it responds to weather," Meier said. But improvements in the models and statistics, together with a growing record of sea ice measurements, make forecasters optimistic about the future. "The hope is that the models can outrun the changes in the Arctic, that we'll be able to catch up and produce more reliable forecasts."